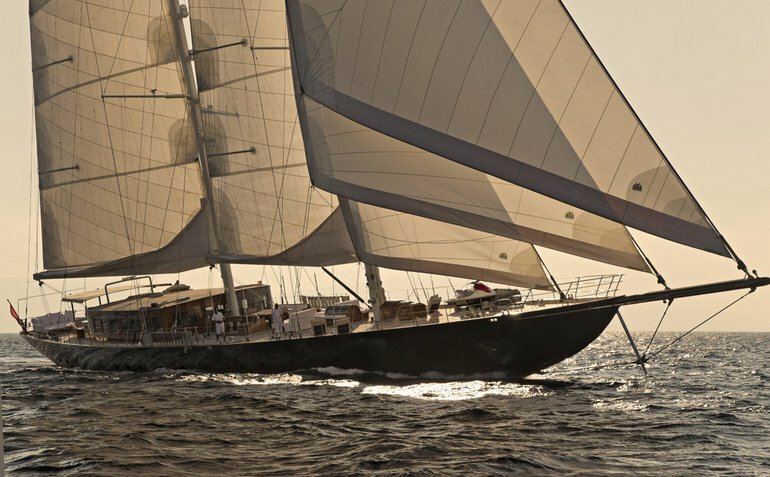 The world famous 56 m yacht Regina, offers luxury crewed sailing charters in the Aegean, Mediterranean (summer) and the Carribean (winter) seas. Regina is well known, partly from her dazzling role in the 2012 James Bond movie Skyfall, for her impeccable design, expansive decks, first class service and elegant dining, accommodating 10 guests in 5 immaculate cabins. The fore deck boasts a sunbathing area as well as seating just in front of the bridge. Guest cabins consist of 2 master staterooms, the larger has a salon and walk in dressing room as well as large bedroom and en suite bathroom. The second stateroom to the fore of the yacht is slightly smaller. Between the staterooms there are a further 4 cabins, 2 large en suite doubles, 1 smaller double and a twin cabin with 2 single beds. As well as air conditioning throughout Regina, there is a fresh air ventilation system installed in all enclosed spaces. Luxury sailing superyacht Regina with large and comfortable dining and living areas, expansive decks and spacious design led cabins, Regina also offers guests a wide range of entertainment and conveniences from LED TVs in saloon and cabins as well as on deck, DVD player, stereo music system, computer games, water sports toys, fishing & snorkeling equipment and more.